Serenity (formerly named Impenetrable Defense) is a Defensive Monk skill unlocked at Level 16. The Monk summons a holy shield to protect himself from damage. The Monk expends spirit energy to summon a holy shield which protects the caster from incoming damage. This one was not needed in the Blizzcon build, since the Monk was quite overpowered in combat. I didn’t experiment with his “dodge” ability, which is mentioned as a by product of several skills, since it was so much more fun just to blast everything with his offense. Plus, testing time is always limited, even in the press room. I would have made sure to try the other element of this skill, the “rebounds enemy ranged attacks,” but there were zero monster archers and virtually no projectile spell casters in the Blizzcon build. 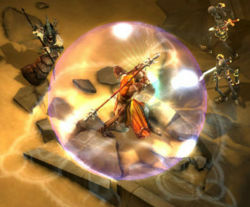 It was slightly modified and renamed to Serenity in the game demo that was presented at BlizzCon 2010 as a Tier 2 skill. Skill tiers were removed shortly before the beta started in September 2011, and Serenity became a level 18 skill. The skill system was once again overhauled for the Beta Patch 13 in February 2012, and Serenity was classified as a Defensive skill and moved to level 16. For Beta Patch 15, the cooldown on Serenity was greatly reduced. See Impenetrable Defense for the original version of this skill. This page was last edited on 15 April 2015, at 14:04.